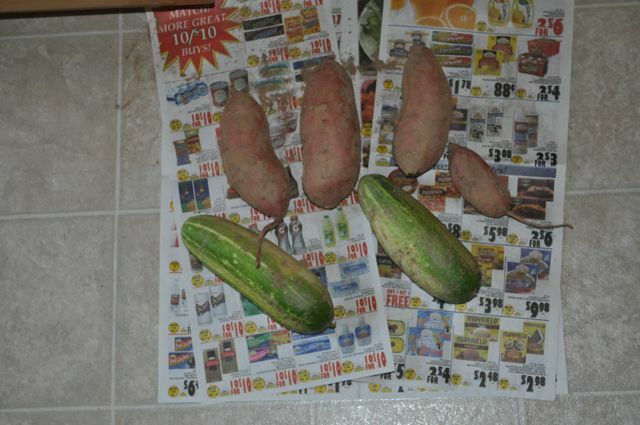 No, the cucumbers weren’t underground with the sweet potatoes. They were just in the garden as well and snuck into the picture. I also picked well over 100 cherry tomatoes, a dozen banana peppers, some bell peppers, jalapeños, and a poblano. The jalapeños are the hottest I’ve ever grown, some almost too hot to eat. This morning I went hiking with a friend from church. We started right when the sun came up (with a light rain, thus no pictures), and hiked about 5 miles—a round trip that went by a fire tower that offers a beautiful 360° view of the mountains. You can see the range of the Smokies from there. Will definitely have to go back this fall. I imagine that you could google Wesser Fire Tower or look it up on YouTube if you were really dying for a look. We flushed four grouse (chickens of the woods as they are called around here) on the walk. And on the drive back down the forrest service road, we ran across a dog with a radio collar. I learned that this is the time of year when people are out training their dogs for bear hunting season this fall. I would never have guessed that dogs could tree a bear, but supposedly that is how it works. My friend James is stopping by tomorrow evening for dinner on his way back to Atlanta from Bryson City. Then we gear up for all of us to start school next week. This entry was posted in Company, Culture, Friends, Garden, hiking, Home school. Bookmark the permalink. What time of the year did you plant the sweet potatoes? You are lucky to be harvesting so late in the summer. Everything here is burned up! It was sometime in May after we got back from our trip to Texas. It’s funny, compared to Texas we have had lots of rain this summer (about 13 inches since June). On the hike this morning there were some trees whose leaves were red and I wondered if being at a much higher elevation and the cool nights we’ve been having, if that was just normal. The guy I was hiking with said he thought it was stress from the warm temperatures and not enough rain in July!